After enjoying my foray into China with the University of Calgary last year, I decided that Marjorie and I should try another course / trip in 2008. 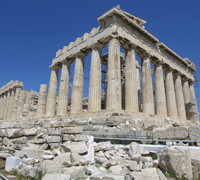 Reviewing the various choices offered by the university, we decided on Athens and the Greek Islands. The trip included some preliminary lectures at the university, then several days in Athens and the surrounding area, followed by 14 nights on a small yacht cruising the Greek Isles. 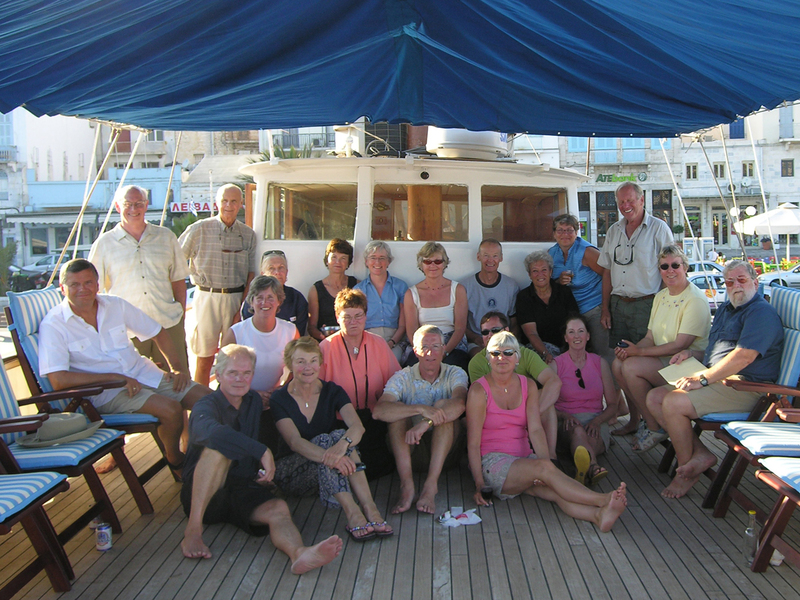 As we have a natural love for cruising, this trip really appealed to us. The 5 lectures (4 evening sessions and one full day Saturday session) covered the major historic periods, from the Stone Age through to the modern Greek era. We also did a session on the myths and mythological figures of Greek literature. The Saturday session included a Greek luncheon with souvlaki, spanikopita and Greek salad. The lectures also gave us the opportunity to get to know the other members of the travelling group. 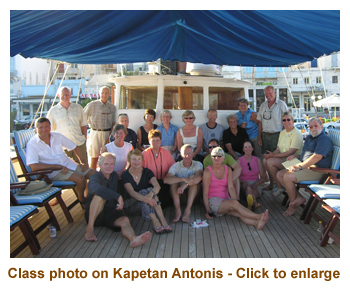 It was a small class (19 students), dictated by the size of the yacht we were chartering. They turned out to be a wonderful group of people and certainly added to our enjoyment of the trip. The cruising part of the itinerary was well noted that it was a suggestion only, and sure enough weather and winds dictated a somewhat different sequence of islands. However, we saw 15 different islands in 14 days and I wouldn't have changed a thing. It was wonderful! Once again, this was a long trip filled with lots of activities each day. As a result, I have broken this diary into 3 parts so that it is not too unwieldly and doesn't take half a day to load! Just click on the part that you wish to view. Note that Day 6 is split over two pages as we did a land portion and a sailing portion that day. The diary is based on a series of emails that I sent out (almost) every night from my hotel room while in Athens, plus journal notes I made while aboard the yacht. Thus it tends to address what I felt and saw along the way rather than being a travel guide to the area. I took over 1,600 pictures but only included a very small subset into the diary. It was hard to pick which pictures were most representative. You can see more of my Greece pictures on WebShots. I need to comment on the Anglicized spelling of Greek placenames. Because there are no hard rules for translating Greek words from the Greek alphabet (Cyrillic) to the English alphabet (Roman or Latin), guidebooks and maps show a variety of spellings for many placenames. For example, you will find Piraeus, Peiraia or Pireas for Πειραιάς, and Nauplion , Nafplion or Nafplio for Ναύπλιο. I tend to use the spellings interchageably. Sorry about that! I have tried to link names and places to Web references for those of you seeking further information. The bulk of them point to Wikipedia pages.